where Martin Luther King, Jr. fell in Memphis, TN on April 4, 1968. And we shall see what will become of his dreams." Common threads run through the legacies of the great ones. Though they may be worlds apart, from different times and places, their destinies lead them to reach for and accomplish visionary goals, which though different in nature, leave a great and far reaching impact not only while they are living, but long after they’re gone. The great ones change the course of history for the better, and it is those common threads that make them brothers in the continuum of time. What makes them different is how their lives and legacies are honored. America does it right. She officially honors her heroes, her great ones, and her finest moments for all of her citizens and all the world to see. That is one of her great virtues. She is not the only country to do this. Each nation honors her own in its own way and each is guilty of omissions. It is when a nation refuses to honor her own great ones for flawed and phony political reasons that the omission becomes glaring and unconscionable. Serbia is guilty of committing such an omission, a glaring and unconscionable omission that needs to be reversed. 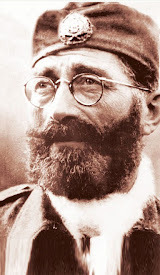 The more I see how my country of America honors her own, the less patient I become with how one great one, the late General Draza Mihailovich, has been treated "officially" by his own country of Serbia, a country he refused to turn his back on, but which ultimately turned its back on him. Though worlds apart, it is the common threads that inspire the comparisons I will make here between how great ones are honored. 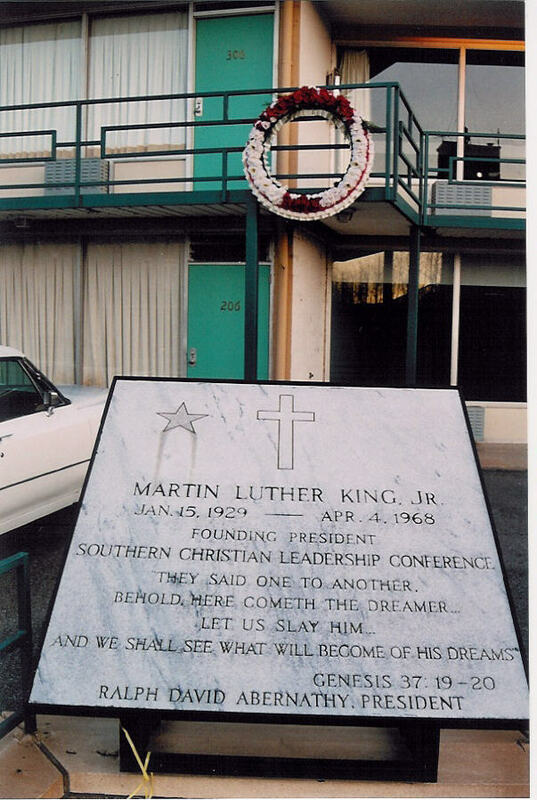 The Reverend Martin Luther King, Jr. was only 39 years old that April 4th day in 1968 when he stepped out of his room and out onto the second story balcony of the Lorraine Motel for a few moments before leaving for dinner with friends. As he stood on the balcony, the window in the building across the street wouldn't have caught his attention. It was a spring day in Memphis and natural for windows to be open as the breezes off the Mississippi River floated through the gritty town. This window, though, was open just a little bit. Just enough. The shooter's vantage point was perfect. And he hit his mark. Today, a small block of cement imbedded in the balcony floor is a reminder of where he fell, while a wreath hangs over the metal railing outside the door of the room that has stayed all these years just the way it was that day. You go there, you see it all, and you are transported back to that moment when one of the finest voices in American history was silenced. From historical civil war sites to Elvis, from mouthwatering barbecue to some of the best blues you’ll ever hear, Memphis, Tennessee is infused with rich American culture and history. Memphis is a gritty town. There’s a smell and feel to it that you won’t find in any other city. The heat in the summer will melt you and Memphis never sleeps. Apart from my usual visits to Graceland and other Elvis sites, I've always made it a point to do something new and come away with yet another special memory every time I go down there. On my visit to Memphis in January of 2004 my plans included a tour of The National Civil Rights Museum. In those couple of hours that I spent walking through this landmark that was built adjacent to the Lorraine Motel, I learned just how profoundly ignorant I am about an entire era of our history. Unless you have a heart of stone, you cannot move through the extraordinary exhibits without being deeply affected. The visitor receives a “live” education that transports him back to year after year of civil rights history as he moves through the museum. The presentation is stunning and successfully establishes a “you are there” quality that transcends time and place. This is an eye-opener for anyone who was unaware and a graphic reminder for those who might have forgotten. The National Civil Rights Museum is comprised of two separate buildings across the street from each other. One tour culminates in an unencumbered view of that fateful room in the Lorraine Motel where the bed has been left unmade, half filled coffee cups line the dressers, ashtrays contain cigarette butts, and the lamps remain lit, giving a warm and cozy glow to the walls. The second tour in the building across the street culminates at the entrance to the room where the shooter stood behind the open bathroom window that remains open. You get his vantage point and just how clearly he had the target standing on the balcony in his sights that fateful April evening in 1968. No textbook can replace this. No lecture, no classroom. I left the museum that day knowing that we don’t, or at least I didn’t, learn enough in school about the things taught here. You cannot leave this place untouched. Five months later during a Memorial holiday visit to Atlanta, Georgia at the end of May 2004, I made it a point to visit the King Center and the final resting place of the fallen civil rights leader. How wonderful it was to complete the story, to travel back in time to see the beginning of an extraordinary life and how it evolved. It was a pleasure to see that the entire block where King was born and spent his childhood and where he had preached his sermons in the Baptist church had all been preserved and well marked. Educational plaques are placed throughout the area, describing the progression of King’s life as a young man. Ebenezer Baptist Church, where he would first make his mark with his preaching, stood as it was and was being restored and preserved with great care. You can walk in and sit in the pews, and there, in the large sanctuary, you can listen to that great voice resonate from the walls as though he were there, speaking to you. Though the physical presence of the man is not there, just hearing that voice echo from the tape that plays for whomever comes in to listen, transports you to a different place and time. You are in the presence of a life that changed history in a positive and productive way, a life that had meaning. 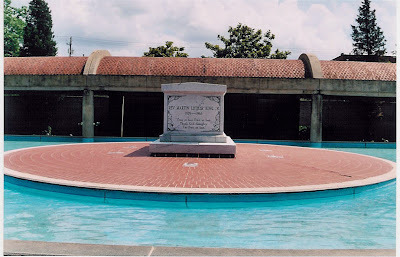 Dr. King’s marble tomb is unassuming and not fancy. It is a dignified monument to a life of dignity. 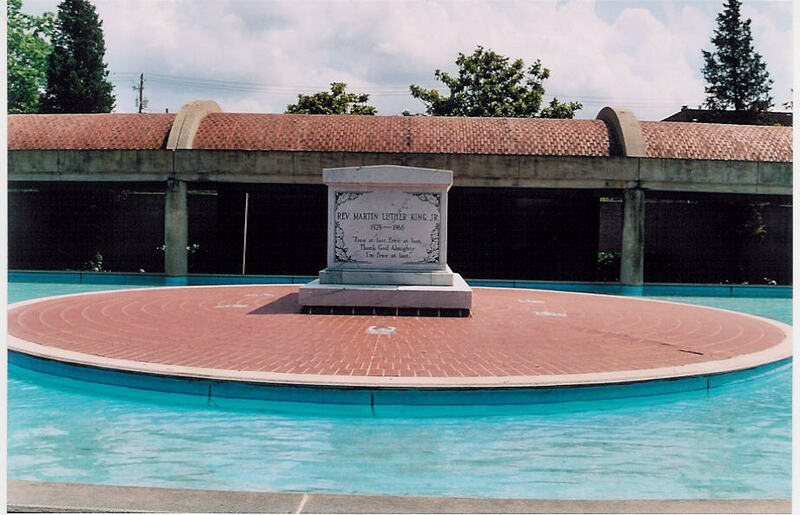 It stands in a large pool of crystal blue water with fountains of water spraying up into the beautiful Atlanta sky. One can sit and rest and watch the people go by to pay their respects. It is there, fittingly, in the same area where he was born, where the church he preached in stands, and where the museum that presents the pieces of his life for the generations to learn from was built in his honor. Dr. Martin Luther King, Jr. has been an inspiration to me from the time of my childhood, many years ago, when I first heard that voice saying those words. That shiver caused by hearing a man that can mesmerize you with the power of his eloquence and the beauty and truth of his message has never gone away. I can hear him speak a thousand times and still the same shiver comes over me, and I am awed. I'm white. I grew up in a white neighborhood. But somehow, Martin Luther King, Jr. was able to speak to me like few white leaders could then and even fewer can now. He spoke to all people. He touched hearts regardless of color. He believed in fairness and dignity. He crossed the lines that had been drawn in the sand. Regardless of the consequences, he never stopped believing in the truth of his message, and the truth of his message continues to resonate long after his death. He was slain before reaching the age of 40, a man in his prime. 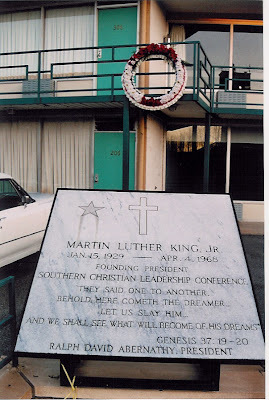 What Dr. King accomplished in his short lifetime, the extent to which his ability to inspire us to be better, fairer people endures, and the wisdom of his words, has lasted through the ages, transcending far and beyond a lifetime cut short by a bullet marked for him as he stood on the balcony of a motel in Memphis. You can still hear him. The speeches were captured on film and will be played again and again. And the shiver will come, for that voice and his message will never lose their power to move us. He was the dreamer, and he awakened America to fulfill her promise as a nation, a promise to benefit us all. Before ever seeing any of this, I remember so well how a display on Knez Mihailova Street in Belgrade, on my first visit to Serbia in January of 1995, struck me as so odd. There in the window of the Museum of American History was a highly visible presentation that paid tribute to Dr. Martin Luther King’s legacy, in honor of African-American History Month. 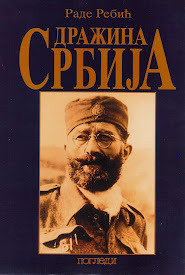 The least of the two reasons it was so odd was that there are virtually no black people living in Serbia, but the bigger oddity was that not once on my visit to Belgrade that winter of 1995 did I see any such public display honoring Serbia’s own General Draza Mihailovich. There was no excuse for this. 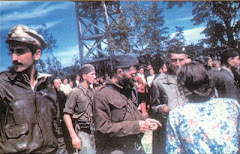 No matter what reasons have been contrived over the years, there was no moral or ethical justification for the fact that no gravesite existed in all of Serbia to mark the true final resting place of General Mihailovich, Serbia’s fallen great one, whose life was taken by the Yugoslav communists. 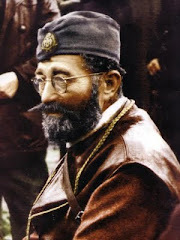 Belgrade was General Draza’s beloved city. 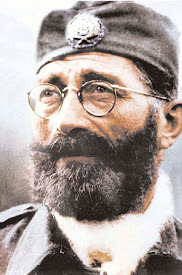 He remained loyal to his Serbian people and to his homeland regardless of what opportunities had come his way to leave, to escape the fate that awaited him. He never turned his back on his Serbia, but Serbia shamefully turned her back on him, a great one that she should be forever proud of. Upon visiting Belgrade again in May of 2003, I made it a point to visit the official final resting place of Josip Broz and was amused by how lavish that final resting place is. A nice park. A handsome bronze statue. Gardens full of flowers(appropriate for a place named the “House of Flowers”), fountains, a huge white marble tomb inscribed with gold letters, and heavy red velvet curtains with gold trim topping it all off at the entry way. 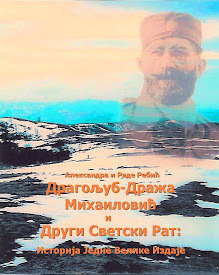 One has to be eternally grateful, especially in light of these omissions, to a group in Ivanjica, Serbia that took upon themselves to erect a memorial to General Draza in the place of his birth and to the Serbian Renewal Movement (Srpski Pokret Obnove - SPO) for establishing a permanent monument to General Draza in the rolling hills of Ravna Gora, where the General’s legacy of greatness became, and remains, eternal. After my first visit to Serbia, as much as it bothered me, I was comforted by the realization that it almost didn’t matter that there was no gravesite, no marker, no "official" final resting place to honor him in all of Belgrade. It meant that Draza was everywhere. His spirit transcends the transgressions of his homeland, a homeland he fought to preserve and to save - the same one that turned his back on him. But, ultimately, it did matter then, and it matters now. Please let us see an "official" marker bringing to life the place and moment that he fell. Let us have an "official" gravesite where people from all over the world can pay homage. 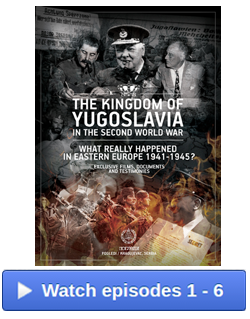 Let us have a place where those who visit and are curious about the history of this land called Serbia can learn about the life and legacy of one of her great ones. Let there be a place where those of us who visit will be inspired to believe in the greatness inherent in men who believe in and fight for honorable causes. 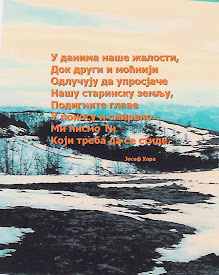 There are those in Serbia who will say it cannot be done, for that would be honoring “the enemy”. I would not argue with them, for they are already beyond any reasonable evaluation of history and honest acknowledgment of its truths and lies. I would tell them, instead, about the South here in America. 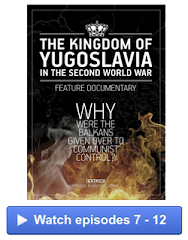 A South that at one time had split with the North as one of history’s greatest and most devastating civil wars began. Here in the American South, you’ll find some of the most patriotic Americans anywhere in the world. Their love for this country is an integral part of their lives and they show it proudly without reserve. But they love their special time in history, too, and here in the South you’ll find that she remembers her great ones as well – the men who led the Confederate Army in its fight for independence from the United States during the American Civil War in the 1860s. Her leaders are honored openly and there is no fear of reprisal for this. Jefferson Davis, president of the Confederacy, legendary confederate general Stonewall Jackson, and perhaps one of the greatest generals of all time, Robert E. Lee, all have their legacies well preserved and presented out in the open for all to see. They were not the victors, yet they are honored, for they are deserving. The citizens of a unified America that were born after the cataclysmic rift are not guilty of treachery for honoring these great ones, though they, at one time, were considered “the enemy”. 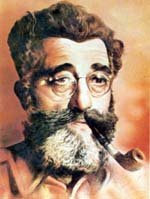 It should not matter how his enemies look upon General Draza. His enemies can only succeed in removing him from the consciousness of his people and the landscape of his homeland if it is allowed - if no one who knows the truth steps up to reverse that travesty. 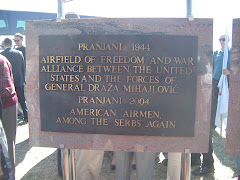 So many of those who fought with General Draza left their beloved homeland and worked from afar to make permanent the remembrance of him and his legacy. Some people made it their life’s mission to do so, though they would never step foot in that land again. There is a new generation now who live and work in Serbia who continue that work. May God bless them and may their numbers be ever increasing. Official state recognition is long overdue. The dictator who committed the crime of ending the General’s life is long gone. The continuing mistakes and omissions of the dictator’s disciples need to be reversed. It is time. Let it not go on any longer that the final resting place of the dictator sits splendidly in the heart of Belgrade, and that the place where Draza fell is unknown and has no official marker. It is time. “Let us slay him and we shall see what will become of his dreams. . .” Let us, as his countrymen, both in his homeland and abroad, prove that the life and legacy of the great General Mihailovich transcends the silencing of his dreams.